Continued rapid growth of both digital and mobile advertising means that soon mobile advertising will overtake all other media to become the top advertising channel in the UK. This interesting forecast by eMarketer may surprise you! Not too many years ago one of the biggest discussions between brands and agencies was whether or not to include a “mobile component” to the next campaign. Now, just a short time later, it seems as though mobile is set to become the top advertising channel in the UK, surpassing print, TV, radio, etc. 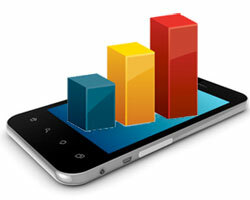 According to a new forecast by eMarketer, in 2014 mobile as spend will be just over £2 billion in the UK. This represents 13% of the total UK ad spend, trailing behind TV (25%), Print (19%), and other digital (34%). 2015 – Mobile will grow to 20.5%, surpassing Print at 17%. 2016 – Mobile will grow to over 27%, surpassing TV at 23.8%. 2017 – Mobile will grow to over 1/3 of total ad spend, surpassing all other digital media which will be only 21% of the total. Within these figures, eMarketer expects more than half of all digital ad dollars will go toward search formats. Spending on display formats will amount to one-third of the UK’s digital ad market.